Why do we snore? What’s making the snoring noise? Roughly 40% of men and 20% of women snore – that’s over 2 billion inhabitants of planet Earth. It’s unlikely that all of them know what snoring is, let alone what’s causing it and what impact it can have. Snoring is the result of a relaxed airway being obstructed, made possible by some design flaws in the anatomy of the human throat. This habit is often shrugged off as annoying and embarrassing but nothing to be worried about. In reality, snoring can affect so much of life, having physical, mental and social repercussions. But what is a snore? At SnoreLab we use a broad definition of snoring: simply, noisy breathing whilst you sleep. This encompasses a few different types of sound from your throat, tongue and nose. The most common snore sound, and the textbook definition of a snore, is the sound of soft tissue in your upper airway (uvula and soft palate) vibrating as a result of interrupted airflow. By having an appreciation of the building blocks of snoring, you can better understand the reasons for your nighttime noises. This is something we can’t change, so don’t worry too much about it. Being still in our sleep prevents us from doing damage to ourselves and others by acting out our dreams or walking around when not fully conscious. Our muscles, including those in our upper airway, are paralyzed when we sleep. Because we are lying down while we sleep, gravity compounds this relaxation to set up snoring – whether it’s your jaw falling open, your tongue falling back or your throat giving way to the weight around it. We definitely can’t change our anatomy either. Even if we could, evolution has been working at it for years, so it would be rude to do so. Snoring can be seen as an unfortunate by-product of human evolution. Specifically, our airway is a victim of speech and upright posture. The human throat has too many functions to do any of them perfectly, and instead does everything adequately. This small section of our body needs to be able to breathe, swallow and generate speech, switching between the three processes seamlessly. All this whilst supporting a head with a heavy human brain. There were bound to be conflicts of interest. Snoring is that conflict making itself known. To achieve the diverse range of sounds in human speech, some facial changes from our ancestral origins were necessary. First, a neck lengthening to accommodate more sophisticated sound apparatus. This necessitated an increase in the amount of soft, muscular tissue unsupported by the harder structures of the skull. Our tongue shapes the sounds generated lower down, and to do so it has to sit further back in the mouth compared to our ancestors. It therefore sits precariously close to the back of our upper airway and risks causing obstruction if it relaxes too much. By standing on two legs we need a precise center of gravity. Evolution has achieved this with changes to hip structure, thigh angle and spinal curve. Additionally, our neck needs to be optimally positioned to support the skull and the heavy brain within. Hence, humans’ throats are more centrally located underneath the skull. This is contary to other mammals, where the throat sits further forward in a nicely spacious neck. Overall, there is less space to fit more material . These conditions are perfect for the third ingredient: obstruction. This is the ingredient we have the most control over: the trigger. It’s also the most complicated. 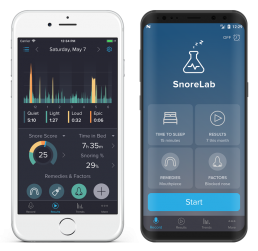 Understanding your obstruction triggers is vital for matching solutions to you and is what we strive to help with at SnoreLab. Tongue – when this falls back it can block your airway. Soft palate – this is the soft tissue behind the hard roof of your mouth and is most responsible for snoring noise. Nose – this is the more efficient way of breathing, and when dysfunctional, mouth breathing ensues and heightens the risk of snoring. Breathing through a partially blocked nose can also create whistling and popping sounds, or even cause suction that collapses your airway. Knowing your obstruction is the starting point in identifying what causes your snoring. If you’re lucky, there’s one cause for your snoring. You can tackle this and sleep quietly. More often than not, multiple factors accumulate to cause your obstruction. Unfortunately, in some cases, the obstruction is simply a part of your anatomy and genetics. Certain face shapes predispose people to snoring. For example, those with a pronounced overbite have a recessed jaw which pushes the tongue further back into the airway, making it more prone to falling back and causing a blockage. Thankfully, these elements are usually associated with risk, not direct cause. They work in tandem with the factors that you do have a say in. By understanding the basis of snoring you can gain better insight into what makes you snore. Just as snoring impacts upon your life, your lifestyle impacts upon your snoring. There are many snoring remedies and solutions available, including products that enthusiastically tell you that this will stop you snoring. Many of them do work very effectively, but only if they are well matched to you and your snoring. Understanding how your snoring works and finding your specific causes is the first step towards healthier, quieter nights.